One of the disadvantages of using head/ear-phones is that once you put them on, you lose all track of the (sound of) things happening around you. In a crowded, noisy environment this is actually a good thing, but when you’re at home where there is, more often than not, complete silence, it isn’t. A new app called Around Sound solves this issue by pausing music on your Android device when it detects a sufficiently loud noise. Check it out after the jump! Have your phone listen around while you enjoy your music! Around Sound allows you to listen to music (or watch videos) and still be aware of your surroundings. We’ve tested the app on a Samsung Galaxy S II on Android 4.0.3 ICS and can confirm that it works as advertised. Around Sound is very simple to set up. Launching the app presents you with a handful of options: Pause Mode pauses your music whenever a loud-enough sound is detected while Resume resumes it from where it stopped. You can set the Trigger Level by sliding your finger (or any other capacitive-display friendly material) over it and finally tap Start to enable Around Sound. Once set up, Around Sound will start listening to your earphones’ mic or your Android device’s mic for loud noises. If detected, music playback will be paused and the loud sound will be played back to you. 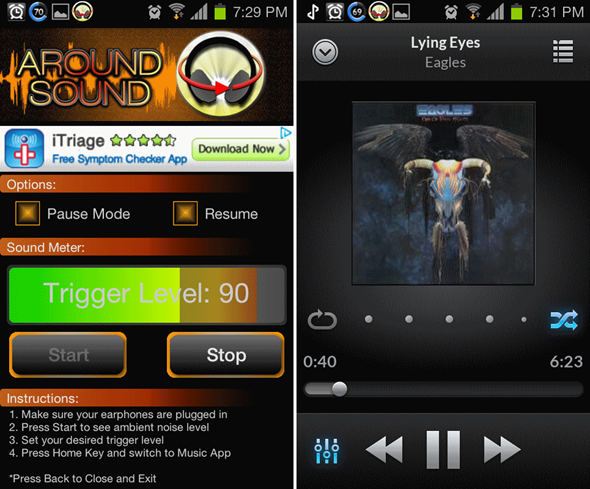 Around Sound works with most popular music apps out there such as PowerAmp, Uber Music, WinAmp, DoubleTwist. It also works with MX Video Player so even videos can be paused! Around Sound is a very interesting concept and it can actually be very useful if you use earphones at home and want to keep track of your baby/dog when they need due attention. It is available in a free version [Play Link] as well as a pro version [Play Link] to support the developer and enjoy an extra “Street Mode”. Don’t forget to let us know what you think of Around Sound by leaving a comment over on our Facebook and Google+ page.